The Energy Show which is now in its tenth year is taking place on Wednesday 14th and Thursday 15th April in the RDS, Main Hall, Dublin and we’ve got our tickets already. We have visited this event in the past and as usual the SEI are planning another great show. There are exhibitors from a vast range of sectors that can help reduce the engery use and therefore the energy cost. 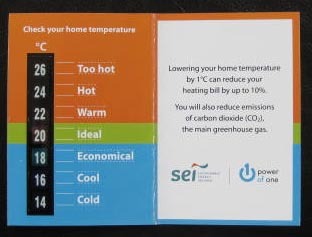 Sustainable Energy Ireland have a great little gadget that I picked up recently at the Ideal Homes Show at the RDS in Dublin, its about the size to a post card and it reads the tempreature in your home. CHP the new buzzword on the energy front. This is the next big thing on the energy saving front for the retail sector, office, educational instituations and any premises with large energy use. CHP is for combined heat and power and has already been rolled out. There is a grant available and the balance is tax-deductable. The unit has an average payback of between 3 and 5 years. This initiative is supported by the SEI, Sustainable Energy Ireland. Why not have solar panels fitted to both help reduce the cost of energy and to heat your water. There are a vast number of styles and types of panel on the market at the moment and most are suitable for the Sustainable Energy Ireland grants. Further details on grants available can be found here. Before renovating an old house check out the grants which are available, as in most cases when having solar panels fitted a new water tank/cylinder is required or comes as part of the equipment, so before you fit a new water tank you could save yourself time and effort and find a grant covers all or some of the labour costs.